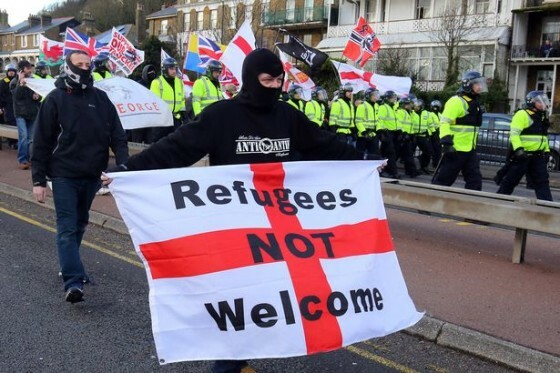 We saw this pattern repeated yet again at Dover where around 200 anti-immigration demonstrators were recently confronted by a roughly equal number of antifa. Because of the attentions of the antifa, the simple act of publicly voicing opposition to mass immigration tends to select for a certain type, one who is not adverse to a bit of violence himself. 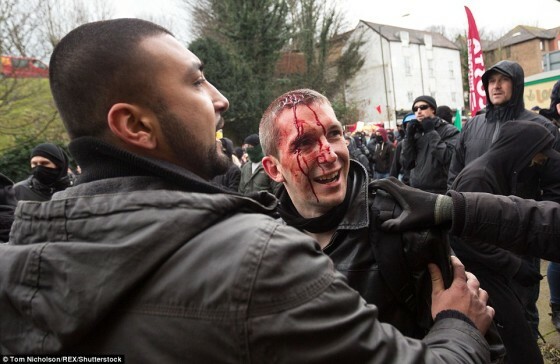 Anti-immigration protesters have to be robust and ready to “handle themselves” in difficult situations. This, of course, suits the purpose of the antifa, who wish to stigmatize anyone who opposes mass immigration or migrant invasions as a thuggish “neo-nazi” A compliant media helps to drive this message home . By creating as much anarchy, violence, and unpleasantness as possible, the antifa hope to prevent the vast silent majority of relatively normal people from joining these demonstrations. In that respect, the antifa fulfil their purpose and have already, in a sense, won their victory just by turning up. But there are signs that keeping the lid on opposition to immigration in this way is starting to unravel. 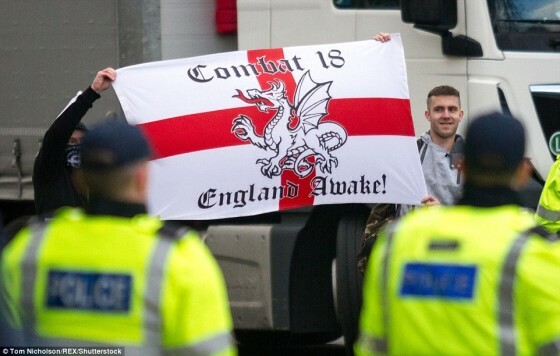 The Pegida movements that have spread to several European countries have taken to the streets but are working hard to avoid the street thug image, wrapping their message in heavily Christian symbolism. A similar strategy was also followed by Britain First, who recently marched through an Islamized part of Bury, white crosses in hand, in a disciplined and effective operation designed to “trigger” Muslims into revealing their arrogance and contempt for the native English. In addition to nationalists adopting new and more effective tactics, another problem for the pro-immigration antifa Left is that they seem to be having trouble attracting or mobilizing the right kind of people to fight their street battles. Back in the 1980s and ’90s, this essentially middle class movement could rely on tough, radicalized trade unionists, with experience in picket lines and other forms of physical confrontation, to provide the necessary working class muscle. But thanks to Britain’s neoliberal economy and its dependency on immigrant labour, the radical working class whites, who provided the most effective contingent in the antifa ranks, have become an endangered species, forcing the antifa to rely more heavily on “soft” middle class anarchist types and a few non-whites, whose evident lack of martial spirit is the reason their countries were colonized by Britain in the first place and hence one of the reasons they are now in the UK. By contrast, the nationalist, anti-immigrant side, although vilified and politically disenfranchised by the current system, still enjoys connections with the white working class, and is able to recruit the kind of lads who are more than a match for the average antifa. 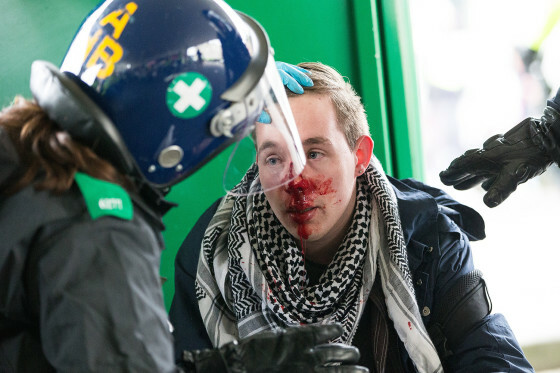 The events at Dover seem to bear this out, with antifa coaches being attacked and damaged at a stop on the way to Dover, while in the town itself the antifa came off worse in various skirmishes, as Civil Liberty reported . On the day, about 200 ‘anti-fascists’ gathered in Dover listening to speeches by black Labour MP, Diane Abbott, and Weyman Bennett, a black SWP Trotskyite from the far-left Unite Against Fascism campaign group, among others. A similar number of nationalist protesters also gathered with large numbers of police officers, some in riot gear, and police vans, keeping the two sides apart. Apparently, a large group of anarchists left during Bennett’s turgid speech and attempted to confront the nationalist protesters before their march started. They were met by a smaller group of nationalists, who routed the anarchists in hand-to-hand fighting. A small group of anarchists were trapped after the street fighting and had to be given police protection for their own safety. Civil Liberty also reported that the day ended with a short rally by the nationalist protesters who claimed victory. For too long the antifa have been able to inhibit legitimate anti-immigrant protests and have them characterized as violent and atypical — even though it has almost always been the Left who start any violence. It is ironic then that by serving the globalist neoliberal elite in this way, they have effectively destroyed one of the bases of their own strength, the radicalized unionized white working class; while the immigration threat they have facilitated also seems to be having a galvanizing effect on the still relatively small numbers of Britons who realize they are involved in an existential struggle for survival.